The Workbench Diary: Our New Arrivals! Well… I was able to finish the shed just in time for our trip down to Camden on Saturday to pick up our baby goats. It was a pretty momentous trip for us. It has been seven years that we have been looking forward to taking on goats and we are finally there. Lots of new beginnings for us this year. The girls did great on the ride back from Camden. Hephzibah (“Effie”) sat on Julia’s lap and Beulah (“B”) rode in a peach crate at her feet. Since they’ve been handled so much by children they really are attached to humans. The shed is complete except the cedar shingle roofing. I will be plugging away at that a little bit each night over the next few weeks. The nails are already staining a bit onto the boards thanks to some recent rain. I must admit, I really do love this look. The hinges were made by blacksmith Joe Meltreder down the road from us. 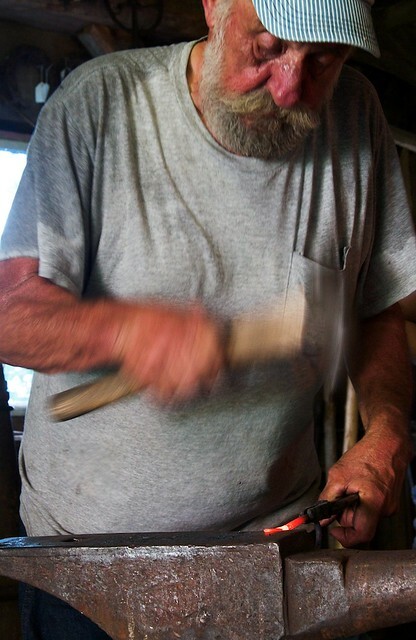 Joe is the blacksmith that does demonstrations at the Wilson Museum in Castine. His work is beautiful. These wonderful strap hinges on traditional pintels along with the door pull cost us $80. This is an incredible deal. If you’ve ever done blacksmithing or have commissioned a blacksmith, you know how much work and skill it takes to create something as elegant as these. I think we have at least ten blacksmiths within twenty miles of our house. (In fact, I’ve heard even the legendary Peter Ross started out in my neck of the woods. )This peninsula is rich with traditional skills. The inside of this 6’ x 6’ shed is pretty simple. Hay manger, water bucket, grain feeder, and goat door. I think I may soon be adding a shelf for them to climb on/sleep on because they seem to have taken to sleeping in the manger’s tray. (Not ideal!) This will be their housing until next spring when I build them a larger more permanent barn. At that point I will be converting this into our garden shed by installing a floor, wall boards, shelves, and a few antique windows. It will be nice to have next year. The fencing around their yard is electrified poly netting. Now that I have a sufficient fence charger, these girls respect the boundary. Effie seems to learn a little slower than B but they seem to get the picture. The studio building has been delayed due to many factors but not insignificantly my hernia/ whatever they finally decide it actually is. It first acted up about a month and a half ago and has been causing problems ever since. Needless to say this is making the logistics of getting this thing completed a little fuzzy. I’m quite sure it is going to take longer than expected. But that’s okay. This is the way life rolls. I frequently remind myself of some sagacious advice a friend shared with me a few years ago: Blessed are the flexible, for they shall not be easily broken. Amen and amen. Great looking shed you built there Joshua! And some fine looking goats too. Just one step closer to being self sufficient! Hope the hernia gets better soon so you can get working on that studio. Thanks, Jamie. I am exploring different ways to work this so that I can get to work on that studio. Glad to hear you had an awesome week in NC! Great looking stool to made! What a great set-up for your new little friends! Great work as always. Thanks for posting the pictures & video. It makes our great distance seem not as far. Thank you, Mom. I am glad the video makes you feel closer to us. We are looking forward to the next time you can come out to visit. Love you! I really like the design and build of the interior of the shed. The hay manger with the natural sticks is downright beautiful. The door looks great with all the battens and the clenched nails. I will be looking forward to seeing the cedar shingling. I appreciate your compliments, Jonas. I look forward to wrapping this project up with the shingles. It will really be satisfying.